There are many perks to living in Central New York--really. Affordable housing, beautiful topography, an ideal place to spend your "past peak oil" years, and, of course access to great wine. Lots of places can claim that last one--wine is being made in all 50 states--but they can't all claim to be producers of delicious, authentic, ice wine. Let's hear it for lake effect snow and freezing temps! Okay, maybe not. But the ice wine is still a wonderful thing and Hermann J. Wiemer Vineyards on Seneca Lake makes a fine one. I had not even heard of ice wine when I tasted it on our big Seneca Lake wine tour over a year ago but once I did, I had to have it. Ice wine, true ice wine, (allow me this purist tendency) is made when grapes are allowed to freeze on the vine and then are harvested with an unusually high sugar content. I've not tasted the kind of ice wine that is made by freezing grapes in a commercial freezer but living in the northeast should mean having access to the real thing. Problem is, you can't get this kind of ice wine every year. The bottle I purchased in 2005 was a 2003 vintage and Wiemer has yet come out with another one. This is what you might call a limited release kind of wine and so I plan on enjoying every sip of my little bottle (375ml). My little bottle that I paid $40 for. And yes, it is worth it. But you have to like it sweet. You don't have to know that this Riesling had over 32% sugar at harvesting. You don't have to know how low the alcohol levels is--some 9.5%. All you have to do is pour this full bodied golden nectar into the glass to know that you are in for a sweet treat. This might be the only time when the descriptor "fruit bomb" is a good thing. I tasted notes of pineapple and honey which, when paired with a chocolate cake, smoothed out and even allowed a slightly puckery (in a good way) citrus note to emerge. Unfortunately, the winery is sold out of this wine but you might still be able to find it in wine shops that carry New York State wines--and Wiemer is relatively easy to find as it goes. If you're looking for a nice dessert wine or something to serve with a cheese course, this is worth seeking out. Maybe this will be the year when another bottling comes out. And if you don't stumble upon a Hermann J. Wiemer release, check out other Finger Lakes or Canadian wineries. You know how that lake effect is--all of our little microclimates might mean that another winery had a banner year for ice wine. Thanks to Kitchen Chick for suggesting this theme and hosting Wine Blogging Wednesday. Hermann J. Wiemer 2003 Select Late Harvest Riesling Ice Wine, $40. My first glass of sparkling wine went down like this: I was 18 years old, a freshman in college, and wanting to play sophisticated. So when the annual Winter Festival came around--aka more excuses to party--I decided that while I dressed up in my semi-formal finest I would listen to music and sip champagne--I mean, sparkling wine. I sipped, got dressed, sipped, put on my makeup, sipped and...fell asleep. I never made it out of the house. 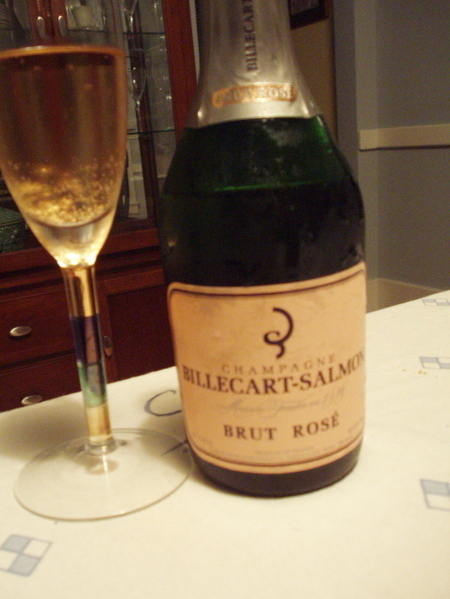 I can't even remember what I was sipping but I was in college so you can probably make a good guess that it wasn't anywhere near as good as the Billecart-Salmon I've been sipping on tonight. Today (and not last week as I thought) is Wine Blogging Wednesday, and this month's host--Sam of Becks and Posh--put out the challenge to write about a glass of Champagne--meaning sparkling wine from the Champagne region of France. There weren't many options in the wine shops of Syracuse for Champagne under $50.00 but I found this half bottle of Brut Rose and now understand how good sparkling wine can be. The beauty of Champagne--like all good sparkling wines--is that it is the go-to drink when you aren't sure what to pair with dinner. In fact, bringing a glass of sparkling wine to a dinner party is a sure way to hit the right note no matter what is being served. I sipped mine with some wonderful antipasti from Lombardi's--it goes great with proscuitto. This Brut-Rose is made with a combination of Chardonnay, Pinot Meunier and Pinot Noir grapes with a little extracted skins to give it a golden rose color. It is fruitier on the nose than on the tongue--with a nice dry finish. This half bottle was just under $35. A little more money than I'd spend on an everyday drink, but yummy enough for me not to wait for a special occasion. And that's my big lesson about Champagne. It really is too good to wait only for a celebration. The last time I had sparkling wine was on my birthday last month--a nice bottle from Shinn Estate Vineyards on Long Island. But today I'm celebrating a day filled with great yoga, wonderful colleagues, and amazing parishioners--just a regular day deserving a fantastic flute of something deliciously bubbly. I've missed a couple of Wine Blogging Wednesday assignments and apparently, I'm not quite with it. First of all, due to an ongoing problem with my computer (an Apple iBook on its last legs) I lost the entry that I actually hoped to post on WEDNESDAY. Now it's Thursday. But then, I realize that after weeks of thinking of some yummy things to grill up to go with a fantastic new wine discovery, it occurs to me... this month's WBW, hosted by Joel over at Vivi's Wine Journal is about pairing wine with Barbeque. Barbeque and grilling are not the same. Let me assure you (and my family in North Carolina) that I do know what Barbeque is. Actually I had some pretty good 'Cue while in Columbus, Ohio last month. But having picked out some yummy Gianelli sausages (a local delicacy--well there isn't much that is delicate about sausages but you get what I mean) I wasn't about to mess them up with Barbeque sauce. By the way, the Gianelli website is worth checking out if nothing else than for the dancing pigs. So sausages on the grill and a bottle of Damiani Wine Cellars white wine chillin' in the fridge, I was all set for an easy, breezy summer night. 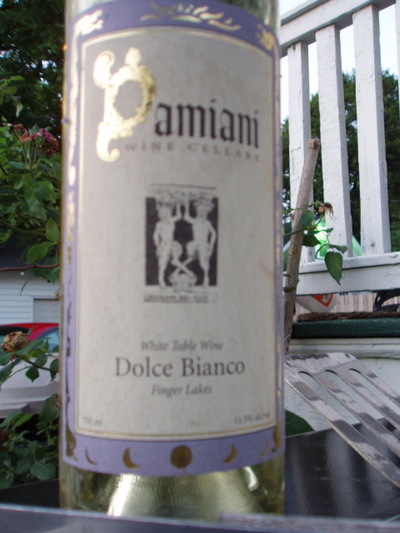 Now I'll tell you, their Dolce Bianco probably isn't the right wine for Barbeque (unless you're talking some Teriyaki Barbeque--and if you're a purist you probably aren't talking Teriyaki) but it is perfect for grilled foods. This wine had enough body to stand up to the char and carmelization on the outside of the sausages and a nice fruity and slightly sweet edge to complement the spice on the inside. Think stone fruit on the nose and a bit of honey on the tongue. While the Dolce goes well with grilled meats (and rich creamy cheeses) I think it also drinks nicely on its own. In fact, it is one of those rare affordable and delicious wines that makes me want to get it by the case. Daminai Wine Cellars, 5281 Peach Orchard Rd, Hector, NY 14841, 607-546-5557. Wine tasting by appointment only until the tasting room opens. Wanna make me happy? Send me an email with the words, "We now ship to New York". Ever since the decision came down nearly a year ago I've been waiting for my favorite non-New York State wineries to send me that cheery little note. Now you know I love New York wines and being centrally located here in Central New York means that I can get to a good winery in as little as ten minutes, or just over an hour, or if I'm making a real trip of it--half a day. However, the same was also true for me in California and when I moved back east I quickly missed the wines that were hard to get even in the Bay Area. Robert Sinskey Vineyards is one of them. Sinskey produces organic and biodynamic wines that are elegant, not overpowering, and best of all, are meant to go with great food. This is no accident since Robert Sinskey is married to a talented chef--Maria Helm Sinskey--who I've written about before. This month's Wine Blogging Wednesday theme, hosted by Wine for Newbies (great wine podcasts by the way) presented a great opportunity to pull out a bottle of Sinskey's Pinot Blanc. I picked this up during my visit to the winery last May and had been holding on to it. That wonderful email, though, changed everything. I could enjoy this bottle knowing that when the next vintage comes out I'll be able to get it without flying across the country. With a WBW challenge to find a white wine that was not Chardonnay or Sauvignon Blanc or Riesling I knew it was time to open this Pinot Blanc. As you would guess, this grape is a close cousin of Pinot Noir. Traditional Pinot Blanc can tend to be fairly neutral and light in aroma and in California the usual tendency is to craft it in a Burgandian style using French oak. Not so, here. Robert Sinskey takes the purist route (practiced in Italy among other places) by using stainless steel tanks. I have to say I loved the results. It is hard for me not to like a Robert Sinskey wine but I'd choose this over his rather nice Three Amigos Chardonnay any day. There are beautiful floral and fruity notes to this Pinot Blanc--a bit of jasmine on the nose and lots of melon and stone fruit on the palate. I enjoyed this wine on its own and with food and found it to be highly drinkable in both settings. Now here's the problem: this vintage is sold out. But keep checking their website or easier still, get on their mailing list. When the next bottling comes out you'll get some good news in your email inbox and in short order will have some great wine in your glass. Note: I know it is probably the height of poor taste to write about a vintage that is sold out from the winery but I promise to make it up to you by posting about a fantastic new release that folks in the Syracuse area can get really easily--stay tuned. Robert Sinskey Vineyards 2004 Pinot Blanc, $18 for a 375ml bottle. Having lived in the Bay Area and now Central New York, I must confess that when it comes to grapes I've stuck to the same ol', same ol'--your Chardonnay, your Pinot Noir, your Cab Franc, your Riesling, and maybe a Syrah. But Wine Blogging Wednesday keeps expanding my palate and this is a wonderful thing. This month's assignment, hosted by Jathan of Wine Expression, was to find a Rhone varietal and write about it. I wanted to find a new world interpretation of these old world grapes and set my sights on California. I also decided early on that instead of going for a single origin wine--like a Viognier--that I would find a blend and I wanted a white too. What I really wanted was a bottle of Tablas Creek Grenache Blanc--but these are really hard to find in these parts. 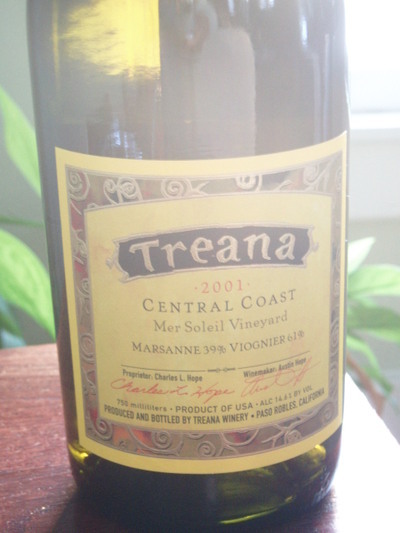 What I found was a fantastic bottle of Treana--and loved it! This 2001 Marsanne (39%) and Viognier (61%) blend was a delightful discovery. Both Marsanne and Viognier are Northern Rhone varietals. You'll often find Marsanne as a base in blended whites, while Viognier wil bring that deep yellow color and tropical fruit notes to a blend. Like the Tablas Creek, these Treana grapes are grown just south of Monterey Bay in what is part of the Paso Robles wine region (a region that I certainly want to investigate further). Most of this wine is aged in French barrels with about 10% in stainless steel. This wine presents a deep gold color in the glass and a few swirls brings notes of citrus and honeysuckle to the nose. When tasting, though, a warm note of honey comes through and balances the acidity just right. This was a great wine to drink both on its own, and paired with polenta and roasted chicken. If this is how they do it in Rhone then count me in. This month's Wine Blogging Wednesday assignment put me in a quandry from the get go. Letting the actual tasting of a wine take a backseat, we were charged with writing about our favorite wine shop. But oops--I had just written an ode to Vinomania, my favorite Syracuse wine shop, back in December. So what to do? 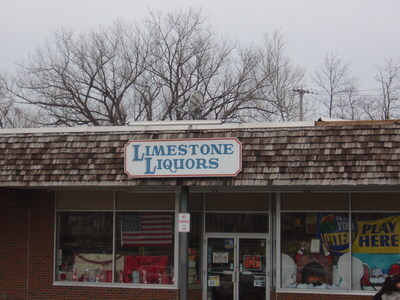 I remembered that over a spirited and delicious New Year's Eve gala dinner, a friend mentioned the place where he buys wine--an unsuspecting gem of a place called Limestone Liquors out in Manlius--just a few miles outside of Syracuse. So you know, if you can't write about the shop you love, love the one....well, that comes highly recommeded to you. I'll chalk this experience up to one of my more successful blind dates. Limestone is a great find for the wine lover. Knowlegeable and friendly staff. I spent time with Kelly, the wife of the owner, and as I sought a recommedation from her about a wine to try, she made sure to ask my preferences and whether or not I'd be drinking the wine with food or not. She could tell me about the weather in Mosel during the 2003 growing season and the effect it had on that year's rieslings--they were sweeter thanks to a dry year. As a rule, they try to taste all the wines they carry so that they will be comfortable selling them. Easy navigation within the store that encouraged browsing while also labeling the lower and medium priced wines for quick scanning. The higher priced wines are given prominent space up front. Shelf talkers are actually helpful and go beyond the standard Robert Parker or Wine Spectator notes. Wine tastings every Friday from 4 -7:00 pm and also on Saturdays. Nice selection of New York State wines--including Long Island! Special focus on German wines. Bonus points for selling Hangar One Vodka and recognizing the name Robert Sinskey. 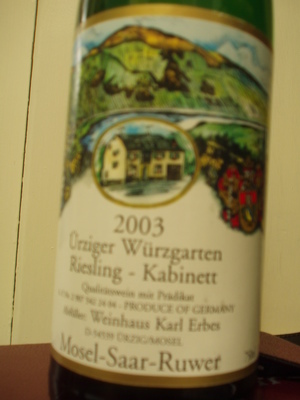 After a dinner in Atlanta last October at the Woodfire Grill where I fell in love with a German Riesling, I could see Limestone as the place to continue my education on wines from Mosel. Plus, a little browsing found me whipping out my notebook to write down the names of other wines I've wanted to try but couldn't find easily at other wine shops such as the 2000 Cloudview red table wine. Verdict: Limestone is definitely a place worth going out of the way for. But if you live in Dewitt, Fayetteville or Manlius, this could easily be your "go to" wine shop. And as if to prove that Limestone is worth the trip I'll have to return just to stock up on that delicious Karl Erbes Riesling they recommended. Thanks goes to Dr. Vino for hosting this month's WBW and enticing me to discover another wonderful wine shop in the Syracuse area. One of the things I love about Wine Blogging Wednesday is the opportunity to look for and taste a wine I might not otherwise seek out. This was certainly the case this month when our challenge, hosted by the Corkdork, had me looking for a New Zealand Red. With my great appreciation for some of New Zealand's wonderful Sauvignon Blanc, it had never occured to me to think about a red wine from that country. First let me tell you how easy it was to pick a wine: VERY. I went to three different wine shops but a phone call finally led me to a place that had a grand total of three wines to choose from. All Pinot Noir from Marlborough--which is typical. Much of the Kiwi reds don't make it to the states and I'm betting that we're not getting the best stuff up here in Syracuse. But with so little to choose from I decided to use techniques from last month's WBW and pick the label I like the most. I went with the 2004 Dashwood Pinot Noir. 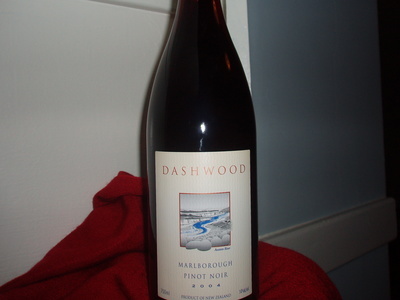 Dashwood is produced by the Vavasour Winery company--they produce other wines under the Vavasour and Redwood Pass labels. I would love to taste one of their Sauvignon Blancs because the Pinot wasn't my favorite. We all know that Pinot as that finicky grape that really can't grow everywhere--at least with the same results. Tasting Pinot Noir from different places--Seneca Lake in NY, Oregon, Napa, and now New Zealand is really helping me understand the differences these growing regions have on this varietal. Bottom line: I'll stick with Kiwi whites. The 2004 Dashwood Pinot had great aromas of cherries and the deep claret color you would expect, but my first impression was that there was "no there, there". It tasted rather thin and much earthier and less fruity than I expected--and desired. After some time to breathe I still found that while the fruit continued to come through in the nose, the flavor on the tongue was rather weak. This wine was recommended as one to drink while young--I'd be interested in how cellaring would affect this vintage. It may be that this Pinot is not among the best New Zealand has to offer. It may be that this grape is one they are still learning to work with. I'll give them some time and then look around for another producer and see how they're doing. I'll be the first to admit that I'm easily swayed by aesthetics. As a graduate of a graphic arts high school and with many hours spent studying photos and slides for art history classes in college I have always viewed wine labels as an underappreciated graphic arts form. So the Wine Blogging Wednesday challenge this month--hosted by Derrick over at An Obsession with Food (and wine)--to pick a pretty label and write about the wine inside had me from the word go. Aesthetics alone, though, would have put me in some new, and possibly expensive, territory so I put some dollar limits on my search. The task was to find a pretty label on a bottle costing $25.00 or less. Any country, any varietal, any appellation. 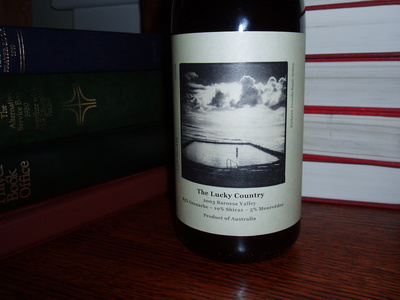 Though I tend to be attracted to color and abstract images, in the end it was the beautiful, sparse, and "bookish" quality of the 2003 The Lucky Country blend from the Barossa Valley produced by Two Hands Wines, that drew me in. Perhaps it is my mood these days or the snow, but the minute I saw this bottle all I could think of was pouring a glass, building a fire, and putting my feet up on the couch with a great book. Hmmm. The image on this bottle is of a rock pool in Australia with a lone figure standing in its midst. It is haunting and lovely, two attributes I hoped to find in the wine. As it turns out, I really loved what was inside the bottle as much as I loved the outside. But here's the thing--this is really a food wine. To really enjoy it, I would have to have, say, a few bites of goat cheese quiche with leeks and thyme to accompany it. But what a small penalty. Two Hands Wines makes a number of Shiraz blends and this one is a combination of 85% Grenache, 10% Shiraz, and 5% Mourvedre. In the glass it is a deep and intense claret color. On the nose, berry and licorice predominate. On the tongue (after a bit of time to breathe) the fruit comes through but does not overwhelm and the finish is quick and dry. With food, however, the fruit comes forward nicely (but not in that volumptous way that is characterhistic of Australian Shiraz) and the finish lingers a bit more. Overall, this is a country I want to come back to. Not quite haunting but definitely lovely. This month's Wine Blogging Wednesday, hosted by Fatemah over at Gastronomie, was tailor made for a wine region like our Finger Lakes. With a challenge to write about a wine with a production of 250 cases or fewer was a cinch given the number of small producers in our area. In this case, the real challenge was choosing a wine. Last Memorial Day found my husband and I circumnavigating Seneca Lake on a chilly and rainy day--not exactly the idyllic circumstances for traipsing through wine country. Perhaps it was our need to drive at a slower speed that caused us to notice Bloomer Creek --a small vineyard located in Hector on the east side of the lake. Bloomer Creek occupies a small building that contains everything except the vines--tasting room, wine production, art display, and gift shop are contained in a small space connected to the fabulous Stonecat Cafe (review coming soon). This small space is only temporary, though. Right outside the window of the current tasting room you can see the frame going up for a new and enlarged facility. 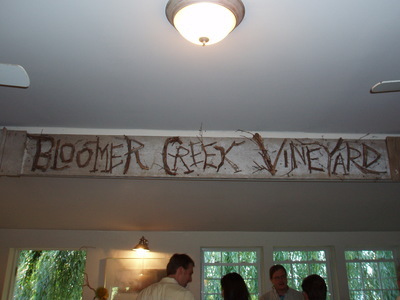 On my first visit to Bloomer Creek I was impressed by tasting room manager and wine producer consultant, Shawn Verity. Here was someone who really knew about the wine and was willing to take some time to talk about it--you'd be surprised by how rare this is. Like the vines growing just outside the tasting room, Shawn has deep roots in the area having honed his skills as a sommelier in area restaurants and heading up the tasting room at Red Newt Cellars up the road. I tasted and took home a bottle of Chardonnay that day and knew that I would have to return before too long. So two weeks ago, on another cold and rainy day, I drove down to Bloomer Creek with the intention of tasting their Pinot Noir for today's WBW. With some 1200 cases total in production, Bloomer Creek is truly one of the boutique vineyards of our area. 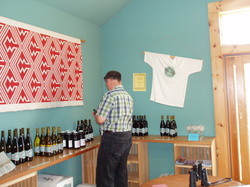 Their wines are impossible to find outside of restaurants and a few wine shops in the Hector/Trumansburg/Ithaca area. The Pinot Noir, with only 106 cases, would have certainly fit the bill for today's challenge, and Shawn even did me the favor of opening up a bottle just for the occasion--the rest are being held until the new building opens next season. This is a light Pinot--somewhat characteristic of the Finger Lakes--with a crimson color, and aromas of raspberries (predominating) cherries, and tobacco. It was aged in barrels made of French and American oak--no new oak. But when it came down to it--I wasn't really into their Pinot. But I was all about their Cabernet Franc. Finger Lakes Cab Francs are really growing on me. I think that for some vineyards--like Lamoreaux Landing --this might be one of the stronger red varietals being produced here. 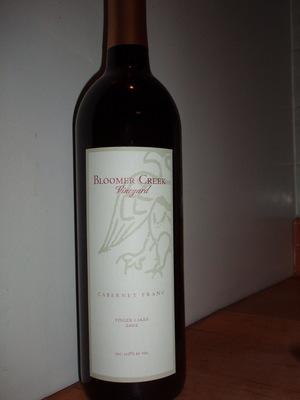 The 2002 Bloomer Creek Cabernet Franc is certainly in that number. Unlike the Pinot which lacked complexity, the Cab Franc was full-bodied, showing a dark garnet color and lots of raspberries on the nose. This is a nicely balanced wine that coats the tongue but won't overwhelm when paired with food. I think it is a wine to savor. I took home a bottle and can't wait for the holidays to roll around to share this with good food and friends and family. Bloomer Creek is a vineyard to watch. They are really passionate about their wines and are interested in not just selling good juice to whoever's buying (did I mention that torrential rains only seems to bring out MORE folks on the wine crawl?) but in cultivating wine lovers. Yes its Friday. Yes I'm late. But Lenn encouraged me to get in this late, late, new, new world Pinot Noir entry anyway. Besides--this would at least add two New York wines to the list being collated by Jens at Cincinnati Wine Garage, the host of this month's WBW. 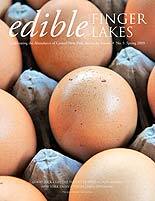 As you probably know, the Finger Lakes are better known for their white wines rather than red. But I'm convinced that some pretty nice reds can come from these parts and I think Silver Thread on Seneca Lake puts forth a great effort. By now we've all heard about the precious, delicate, and capricious Pinot Noir grape. It would be the Sally (of When Harry Met Sally) of grapes--pretty high maintenance. So when you take high maintenance needs and put them in what may be called...more challenging growing conditions like upstate New York--well it's a wonder we get any bottles of it at all. Richard Figiel, the owner and winemaker takes a hands on, small batch approach to making Pinot Noir--even using an old fashioned basket press to do it. When I was at the winery last month he was out front tending to the basket press and giving me recommendations for the last WBW. When you factor in Silver Thread's policy of not using chemical or artificial fertilizers, pesticides, and herbicides I'd say you're tasting a bit of a miracle in a glass. 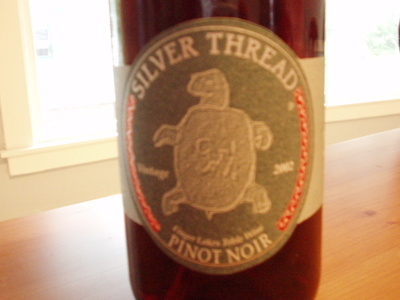 Silver Thread's 2002 Pinot, which I picked up at about this time last year, is a wine I could drink every night. It isn't like the Pinots coming out of the Willamette Valley in Oregon which tend to be a bit deeper in color and body and more velvety on the tongue. Silver Thread's offering is all cherries on the nose, a medium body like the color of a garnet stone with the sun shining straight through it. Underneath the cherries I could detect a subtle earthiness that really firmed up this wine. This is a springy Pinot Noir that stood up well to my all natural, grass-fed burger topped with a slice of goat cheddar. I'm pretty sure they're out of the 2002 vintage and I'll have only a couple weeks more to get over there to pick up some of their 2003--but it will be worth it. The 2004 winter was so harsh they weren't sure if they'd have any Pinot Noir so if you want a bottle, best to give them a call and see what they can ship you (NY State only for now.) And Lenn, I'll get you that bottle. I promise.